Our first production 'CODE NAME: BULLET - The Story of the Triumph TR7 & TR8' was released in April 2007 to widespread critical acclaim. This was a new type of automotive documentary that involved the people responsible for bringing the car to market and making it a success. Historic footage (much of it previously unseen) and images helped to tell the history of this controversial car and an interview with the car's designer, Harris Mann, answered many of those questions which explained why the car was the way it was. 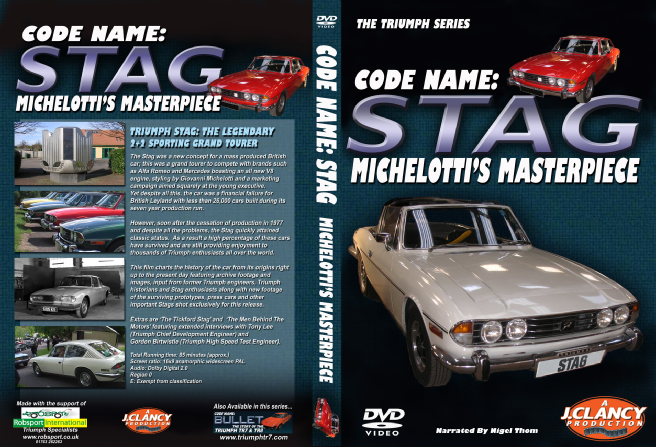 As a result of the success of the Bullet DVD, and because of repeated requests from enthusiasts, another Triumph production was undertaken...'CODE NAME: STAG - MICHELOTTI'S MASTERPIECE'. This too was very well received and just like 'Bullet' before it, was seen by many former Triumph personnel. As a result we have been able to interview many more former Triumph engineers for subsequent releases. 'CODE NAME: BOMB - The Story of the Triumph Spitfire & GT6' came out in 2009 and thanks to the input from the men who engineered and styled this range of cars contains much information that was previously unknown about the history of these vehicles. 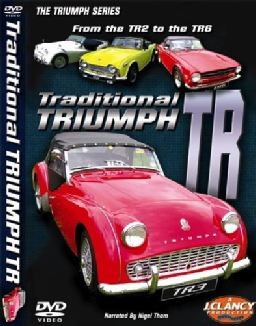 And at the end of 2010 the most eagerly awaited TriumphDVD release 'Traditional Triumph TR - From the TR2 to the TR6' was made available, followed in 2012 by 'Triumph: The Saloon Models 1946 - 1984'. These are both groundbreaking productions the like of which has not been seen in an automotive documentary with the possible exception of previous TriumphDVD releases. Then at the end of 2013, following years of pleas and requests from Triumph Wedge enthusiasts from all over the world, an all-new TR7 & TR8 documentary was released in the form of 'BULLET RELOADED: TRIUMPH TR7 & TR8 IN DETAIL'. This production was a massive undertaking and believed to be the most comprehensive classic car documentary on a single model ever produced. Whilst DVD sales around the world are down significantly it seems the appetite for documentaries released on DVD for famous British classic cars is set to continue a while yet. The Rover SD1 featured in the line-up for 2016 along with the extensive double disc release ‘The Standard Triumph Story’ which was designed to act as a bridge between all the myriad instalments in the long running Triumph Series. 2017 has seen another ‘Wedgy’ release with the ‘National TR8 & TR7 Sprint Day’ and also the extensive ‘The Rover Story’ telling the full and turbulent history of Rover cars. All Triumph DVD's are available from this web site SHOP and many Triumph dealers. To order any Triumph DVD by telephone using credit card the main dealer is Robsport International - +44 (0)1763 262263.
are PAL only. There are no region codes applied to any TriumphDVD releases.